Cell Checker, Low Voltage Buzzer Alarm, for use with 1 up to 8 cells - LiPo / Li-ion / LiMn / Li-Fe batteries with JST-XH connections. This essential device, features a very loud alarm and a red LED to notify you once your cells reach a user defined voltage - pre-set value 3.3V. As the buzzer can be heard from a distance, you can put this device on your multi rotor and use it as on-board alarm. You can customize the alarm to sound at a voltage between 2.7v~3.8v per cell in 0.10v increments by pressing the setting mode button. This unit also features a handy built in LED display that will show the voltage of each cell followed by the over all voltage of the pack. 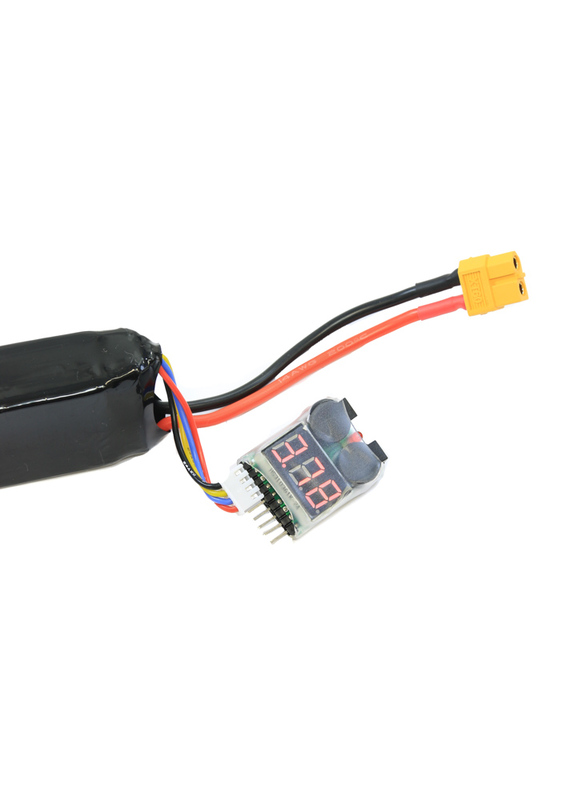 Don’t risk your multirotor by flying on depleted batteries, this essential device puts an end to guessing how much flight time you have left in your LiPos! We sell two versions of the LiPo alarm, cased and un-cased. Note: LiPo battery not included. if i only need to detect one lipo battery and how to connect? The second product image shows how to connect - plug into your LiPo balance port with the ground wire to the left. A LiPo alarm / tester is a must have piece of equipment for any flight box. LiPo batteries require careful management to maximise their life; they can be charged up to 4.20V and discharged down to 3.0V per cell. Any lower or higher in voltage and the cell will almost certainly be irreversibly damaged (reduced capacity or total inability to accept a charge). Furthermore, a damaged cell may become unstable which can be very dangerous (increased fire risk). A LiPo alarm / voltage tester is therefore an essential piece of kit to monitor the status of your individual cells and avoid damaging them. Most pilots who fly without a telemetry feed use a LiPo Alarm on board their craft to alert them as to when it's time to land - it's recommended to set your alarm to 3.6V to give you enough time to land safely.